Downtown Hyder. Actually, most of Hyder. Tiny little Hyder (pop. ~100) sits at the far end of the 90 mile long Portland Canal, the longest fjord in North America. North of Ketchikan and east of everything else in Alaska,1 there is no obvious reason why it is part of Alaska, or even exists at all. Like the answer to most questions in Alaska, the answers involve part politics and part gold. The [boundary] shall ascend to the north along the channel called Portland Channel as far as the point of the continent where it strikes the 56th degree of north latitude; from this last-mentioned point, the line of demarcation shall follow the summit of the mountains situated parallel to the coast as far as the point of intersection of the 141st degree of west longitude. Whenever the summit of the mountains… shall prove to be at the distance of more than ten marine leagues from the ocean, the limit… shall be formed by a line parallel to the winding of the coast, and which shall never exceed the distance of ten marine leagues therefrom. It took an international arbitration panel to sort out where the line actually was, interpreting the words of diplomats decades earlier working from bad maps and little knowledge. The outcome was do dissatisfactory to Canadians that it contributed to Canada’s independence movement. Varying claims in Southeast Alaska before arbitration in 1903. In blue is the border claimed by the United States, in red is the border claimed by Canada and the United Kingdom. Green is the boundary asserted by British Columbia insofar as it differed from the British and federal Canadian claim. 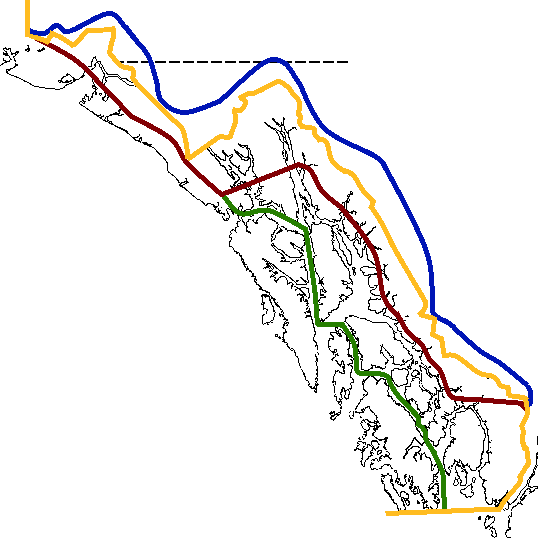 Yellow indicates the modern border. From Wikipedia. 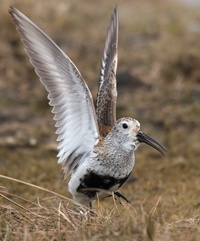 The arbitration panel chose the middle of Portland Canal, and at 56° North Latitude, you strike the peninsula between the Bear and Salmon Rivers just a little to the west of the tip. That left part of the peninsula for Alaska. Modest mining activity up the Salmon River resulted in a town, now nearly, but not quite, a ghost town. The U.S. got the interpretation it wanted because the British member of the arbitration panel was trying to improve relations between the U.S. and Britain. So, politics and gold, once again. Neither Hyder nor its sister neighbor of Stewart – the only route to Hyder – have marine highway service any longer. Partly, it’s lack of traffic. Partly, it’s the gradual filling of Portland Canal from the vast volumes of glacial flour and other sediments coming down the Salmon and Bear Rivers. Partly it’s isostatic rebound, as the ice fields continue to recede. 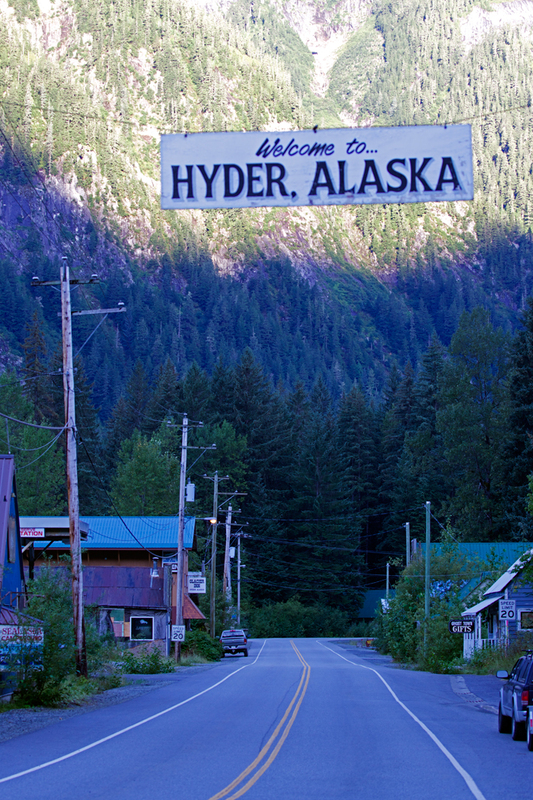 So the good news is that Alaska is gaining land; the bad news is that Hyder is nearly portless. It’s a charming little town, worth a visit if you are down the Cassiar Highway some day. Both the town, the border, and the isolated customs post (anybody home?) look even more intriguing on Caltopo.com. (The link above should take you right there). Caltopo includes USGS and Canadian topo maps as well as standard Google maps, plus Open street map. You can use the upper right-hand menu to add different base maps and change their opacity. Thanks for sharing your journey, WC. P.S. Not to go on about the maps, but when I tried to follow the long aerial tramway upstream to the mines it served, I noticed a funny glitch where the USGS map just north of Hyder is misplaced (note stray Blake Channel and Wrangell Island). Switching to (or overlaying) the ArcGIS topo displays the missing USGS quad and upper Salmon River to (but not across) the border. Caltopo’s ArcGIS topos switch from 1:24K to 1:100K to 1:250K quads whereas the USGS mode stays at 1:24K at any zoom. I find the 1:100K series handy for understanding Alaska’s vast geography. Not the same as being there of course.